Russian court sentenced opposition leader Alexei Navalny to five years in prison on embezzlement charges. Navalny decided to withdraw from the mayoral elections in Moscow. According to a report from Interfax, the Leninsky District Court in Kirov (about 560 miles from Moscow) has found opposition activist Alexei Navalny guilty of embezzlement of property belonging to the state-run timber company Kirovles and sentenced him to five years in prison, in line with a sentence Judge Sergei Blinov handed down on Thursday. The court found Navalny guilty of organizing an embezzlement scheme that cost Kirovles almost $500,000 by forcing it to sell timber at below-market prices when he served as an unpaid advisor to the Kirov Region’s governor in 2009. Co-defendant Pyotr Ofitserov was also found guilty and sentenced to four years. A long-time acquaintance of Navalny’s, Ofitserov ran the Vyatka Timber Company and was accused of willingly buying Kirovles timber at below-market prices, thus taking part in the alleged embezzlement scheme. The court also levied a fine of 1 million rubles (about $31,000) to be split between the two defendants. Earlier this month prosecutors requested that Navalny get six years in prison and a fine of 1 million rubles ($30,000). For Ofitserov, prosecutors had been seeking a five-year prison sentence and a 1 million-ruble fine ($30,000). Both defendants have pleaded not guilty. Navalny, a whistle-blowing blogger known for leading mass protests against Russian President Vladimir Putin, has denounced the charges as politically motivated. The court found his claims groundless. "Navalny's allegations about political motives behind his prosecution have not been confirmed by anything," Judge Blinov said in handing down a guilty verdict. Opposition figure Alexei Navalny and businessman Pyotr Ofitserov were taken into custody after the sentence. The defense team for opposition activist Alexei Navalny is determined to appeal against his conviction within ten days. 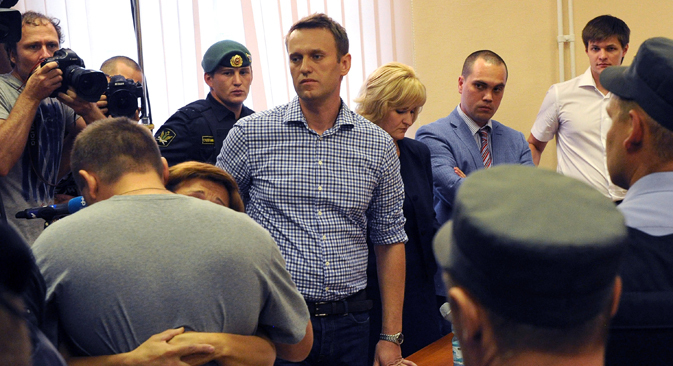 Before the sentence takes legal effect, Navalny will be held at a detention facility in Kirov. Navalny’s supporters have pledged to hold a demonstration in downtown Moscow on Thursday evening. On July 17, the Moscow City Election Commission registered Navalny as the RPR-Parnas party’s candidate in the Moscow mayoral election – due on September 8 – but after the sentence Navalny's campaign staff, represented campaign staff head Leonid Volkov, announced the blogger’s withdrawal from the race. "It was previously agreed upon with the candidate that, if he got real jail time, we would not participate in the elections," Volkov told. Civil Support Committee head Svetlana Gannushkina has said that the decision to sentence opposition activist Alexei Navalny to five years in prison will have negative consequences for Russia. "Everything is clear - the political trial, the politically motivated accusations and the politically motivated verdict," Gannushkina told. "I do not have any tender feelings toward Navalny. He does not think the same way as I do. But I believe that this conviction is a terrible thing. Such things will entail destructive consequences for the country," she said. Remarkably, U.S. ambassador to Russia Michael McFaul has said that representatives of the U.S. diplomatic mission were en route to the city of Kirov, as the Navalny trial took place. "Yes, we sent someone from our embassy," McFaul said on his Twitter page on Thursday. "It’s what diplomats do – report on events where they are located to our leaders back home," he said. The U.S. ambassador earlier wrote in a message to Navalny on Twitter: "Privet. Smotru. [Hello. I am watching.]" The court of Kirov started the hearing for the case of embezzlement from the Kirovles company on April 17. The prosecution claims that more than 10,000 cubic meters of timber were stolen from Kirovles between May and September 2009, inflicting damages of more than 16 million rubles on the Kirov region's administration. Navalny, who at that time served as an advisor to regional governor Nikita Belykh, was accused of organizing the alleged theft. Ofitserov, who headed the Vyatka Timber Company, and Kirovles’ chief executive Vyacheslav Opalev were accused of complicity in the alleged embezzlement. In December 2012 Opalev was given a suspended four-year sentence with a probation period of three years. Governor Belykh was among those questioned during the trial.